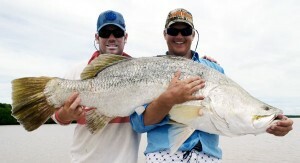 The biggest fish for the 2012 Kakadu Klash barramundi fishing competition was 106cm, pictured here, caught by Matt Rawlinson of Team Rapala. Full Kakadu Klash 2012 results and discsussion here. 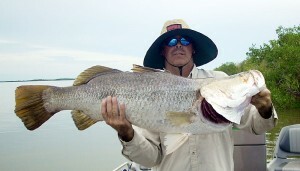 They don’t get much better than this, caught by Brendan de With, at Roper River’s Blackfellow Creek. Picture sent in by Warren de With of Katherine Rod and Rifle.